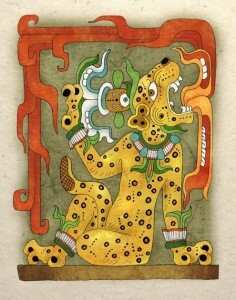 Today, 2-3, is the Maya calendar day 11 Ix (Jaguar), wonderful day to work with inner power, the earth and forest energies, and the four directions. A nocturnal animal and a powerful totem, Jaguar’s energy assists us in managing and adapting to change, and in listening to the subtle signs of nature all around us. In Kundalini yoga tradition the number 11 is the highest level of spiritual attainment, while in the Maya tradition it is also auspicious as it assists us in dynamic action and solution creating acts of wisdom.